The Santa Cruz City Council voted 5 to 2 against a change to the law that would decriminalize public sleeping, covering with a blanket, and sleeping in a vehicle. The Santa Cruz city council voted 5 to 2 opposed this evening against an amendment to the city law Municipal Code 6.36.010, also known as the camping ban. The proposed amendment would have removed references to sleeping and covering up with a blanket from the text of the law, as well as removing references to sleeping in cars. Effectively, these changes would have made it legal for people sleeping outdoors to do so without fear of citation by police. Ex-mayor Don Lane brought the amendment forward with an effort to allay community fears that such a change would lead to sudden influxes of people into the community or increases in behaviors many commonly associate with unhoused people. Councilmember Lane specifically referred to camping, public defecation and urination, and littering, with the point that laws already exist in the Santa Cruz municipal code that make these behaviors illegal. Thus, the proposed amendment to the camping law would have little effect on the tools that the police force already uses to control such activity. Other councilmembers had many questions and concerns for Lane. They discussed issues of encouraging houseless people to come to Santa Cruz, maintaining tools for police to use to discourage houselessness in general, and whether city resources could be better spent on assistance programs over decriminalization efforts. 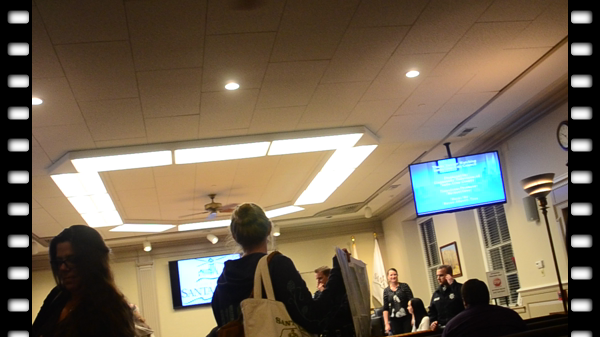 Considerable bad feeling followed some of their questions, as the crowd of people present for the council's discussion was almost overwhelmingly in support of Lane's proposed change. The council chamber was entirely packed, with completely full benches and many people standing in the rear and along the walls. Very few people spoke against the change during the public discussion period, though some were present. Common sentiments from those who spoke against the amendment included fears of increased presence of car sleepers in local neighborhoods, revulsion at public defecation or urination, and the idea that more houseless people would come to Santa Cruz if sleeping were decriminalized. Supporters of the amendment spoke repeatedly about the morality of criminalizing people for sleeping outdoors given no other alternatives, the negative effects of sleep deprivation on houseless people trying to keep themselves healthy enough physically and mentally to get off the street, and fears of lawsuits against the city or loss of federal money due to new funding criteria from the department of Housing and Urban Development. Councilmember Lane also mentioned HUD in his presentation. He referenced a consultant hired by the city to deal with applications for funding, who stated in an email that criminalization laws were likely to negatively impact Santa Cruz's application for money from HUD. Councilmember Rochelle Noroyan questioned the city manager and city attorney on this point, who responded that the possibility of losing large sums of money was unlikely, given that this particular issue was worth only a few points in the city's application for Continuum of Care funding. Continuum of Care is the series of programs and bodies shared between the city and county that provide services for houseless people. After the council voted, the room erupted in angry mutterings which built rapidly to chants of “Shame on you! Shame on you!” Several members of the assembled crowd stood at the rail between the council and audience benches and shouted at the councilmembers as they exited the chambers. They appeared to fluster the councilmembers to no small degree; Councilmember Comstock actually flipped one angry community member her middle finger on her way out. A lot of energy was present among the people waiting around after the council session. Clearly this issue was not put to rest last night and it's likely that Santa Cruz will be in for more activity around the camping ban in the near future. Look out for councilmember comstock flipping someone the bird at the end of the video. she's on the left side, in blue.